The guides are designed to give instructions and recommendations for securing Mac OS X and for maintaining a ultra secure computer system. 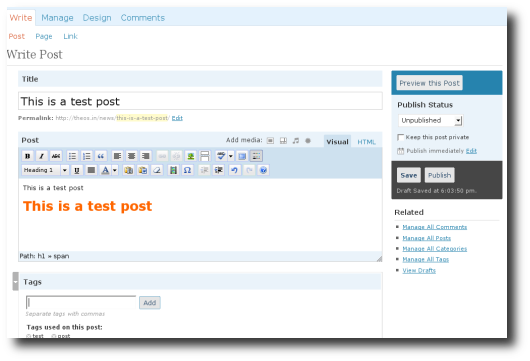 WordPress 2.5, the culmination of six months of work by the WordPress community, people just like you. 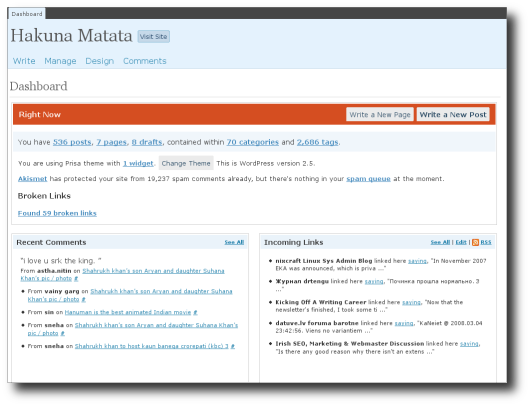 The improvements in 2.5 are numerous, and almost entirely a result of your feedback: multi-file uploading, one-click plugin upgrades, built-in galleries, customizable dashboard, salted passwords and cookie encryption, media library, a WYSIWYG that doesnâ€™t mess with your code, concurrent post editing protection, full-screen writing, and search that covers posts and pages. You can use this tool to check the security of your own network as it allows to forge or decode packets of a wide number of protocols, send them on the wire, capture them, match requests and replies, and much more. It can easily handle most classical tasks like scanning, tracerouting, probing, unit tests, attacks or network discovery. It also performs very well at a lot of other specific tasks that most other tools can’t handle, like sending invalid frames, injecting your own 802.11 frames, combining technics such as VLAN hopping+ARP cache poisoning, VOIP decoding on WEP encrypted channel, etc.